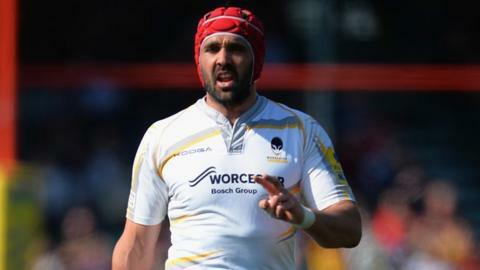 Worcester flanker Jonathan Thomas has committed himself to a further two years at Sixways by signing a new deal. The 32-year-old former Wales international's current two-year contract was due to expire this summer. But he has signed up again not knowing which division the promotion-chasing Warriors will play in next season. "When I signed I understood there were tough times ahead and that we'd need to go through those before we could really move forward," Thomas said. Jonathan Thomas won his first cap on the summer tour to Australia in 2003 before playing in the Rugby World Cup later that year, and has scored seven tries in 67 appearances for Wales,. He was named in eight consecutive Six Nations squads between 2004 and 2011, featuring in the Grand Slam winning teams of 2005 and 2008, as well playing in a second World Cup in 2007. "After the disappointments of last season we're now on the other side of those days and the club is making fantastic progress. "The challenge of helping this club become a successful one is something that really excites me. My family have also settled well in the area and I feel part of the club and the wider community. "Hopefully we can continue to progress and create something special." Thomas was newly-installed director of rugby Dean Ryan's second signing when he arrived from Ospreys in May 2013, and his first choice to be captain, although the role has been passed on to South African G J Van Velze this season. "As one of the club's most well-respected and senior players, JT has illustrated his leadership skills time and time again," said Ryan. "His attitude on and off the pitch embodies the way this club should be represented. His presence around some of our younger players has been crucial to their development." However, Thomas will not be involved in Saturday's British & Irish Cup quarter-final against Pontypridd at Sixways. Worcester have named a weakened team, making 13 changes from the side who won 50-10 at Midland rivals Moseley last weekend. "We're very respectful of Pontypridd," said head coach Carl Hogg. "They came through their pool stages very successfully. "We'll need to be on the money to get the result, but we'll use the group who've done really well throughout. They've shown great endeavour and character to come out on top of every contest so far. It's only fair that they get an opportunity to play in a quarter-final." Worcester, who won all their six B& I Cup group games, are chasing their 18th straight win in all competitions. Worcester Warriors (v Pontypridd): Howard; Stephenson, Fatiaki, Symons, Hammond; Mieres, Mulchrone (capt); Bower, Annett, Rees, Percival, Sanderson, Taylor, Gilbert, de Carpentier. Replacements: Sowrey, Fainga'anuku, Daniels, Kerry, Bruzulier, Stevens, Humphreys.